The Samsung SLA-880 C-mount Motorized Zoom Lens with a focal length of 8-80mm, is designed to be used with a 1/2" and 1/3" CCD sensor and offers 10x zoom. It also comes with built-in presets. Auto Iris (DC) feature is highly flexible in producing consistent video signals, and it can help the camera to adjust to drastically changing light levels. The Samsung SLA-880 has many exciting features for users of all types. 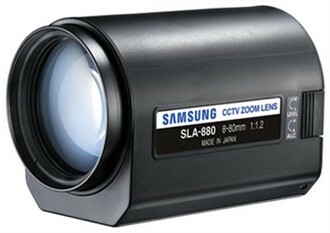 See the Samsung SLA-880 gallery images above for more product views. The Samsung SLA-880 is sold as a Brand New Unopened Item.